How Many Vitamins and Minerals Do I Need? Do I Need More Vitamins During Pregnancy? How Can I Get Enough Vitamins and Minerals? What Are the Benefits of a Women’s Multivitamin? Who Can Benefit From Taking a Women’s Multivitamin? How Do I Take a Multivitamin? How Do I Pick a Good Multivitamin? In order to help you find a good product, we’ve narrowed down the best multivitamins for women on the market right now. 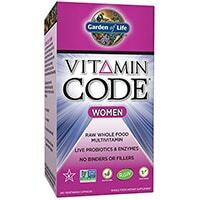 Vitamin Code Women is a complete daily multivitamin made with raw whole-food ingredients. Most multivitamins use synthetically derived ingredients, but Code Women uses whole foods to create a balanced, healthy women’s multivitamin. It is a bit more expensive than the average multivitamin, but given the wholesome and organic ingredients used, the price is well worth it. Complete multivitamin, consisting of vitamins A, C, D, E, a powerful B-complex blend, and many more. Complete mineral blend, consisting of calcium, zinc, iron and more. 110mg RAW probiotic and enzyme blend, consisting of lipase, protease and more. Who makes it: Vitamin Code Women is made by Garden of Life. For many years, Garden of Life has been a leader in the health-foods industry, developing and manufacturing healthy, wholesome foods and supplements for a wide range of people. They focus on the use of whole, organic foods and raw, untreated ingredients. Rainbow Light Women’s One Multivitamin is a complete, effective and affordable women’s multivitamin. With a potent blend of all the standard vitamins and minerals, plus added ingredient, Women’s One is a complete and balanced once-daily that can help keep your health on track. It is also a very affordable product, so it’s a great choice for ladies on a budget. Complete multivitamin, consisting of vitamin A, C, D, E, K, B6, B12, and many more. A blend formulated specifically for women’s health, this balanced multivitamin supports overall health. Complete mineral complex, consisting of calcium, zinc, iron, and many more. 125mg Women’s Nourishing Blend, consisting of dong quai, spirulina, and red clover. 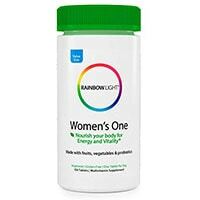 Who makes it: Women’s One Multivitamin is made by Rainbow Light. For many years, Rainbow Light has been a leader in the nutritional supplement industry, using natural and sustainable ingredients to create wholesome, healthy supplements to help keep their customers healthy. 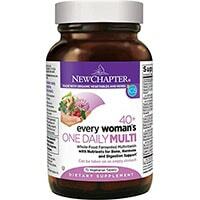 Every Woman’s One Daily from New Chapter is a high-quality, complete multivitamin supplement that contains fermented vitamins. This is a form of vitamin that is easier for the body to absorb, meaning that you get more of the goodness out of each and every tablet. It contains all your essential vitamins, minerals and iron, plus 3 unique blends of natural extracts, specifically designed to meet women’s health needs. Who makes it: This multivitamin is made by New Chapter, a natural supplement brand with over 35 years’ experience in the business. New Chapter aims to use nature’s wisdom to improve health and wellness. They offer free shipping on all products and their customer service is second-to-none. 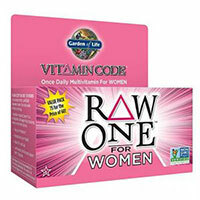 Garden of Life Raw One for Women is a once-daily vitamin for active women. Using a blend of raw, unprocessed ingredients, Raw One delivers a healthy and balanced blend of whole food nutrients to support overall health and well being. Complete multivitamin and mineral formula, consisting of vitamin A, C, D, E, K, B6, B12, folic acid, calcium, zinc, and many more. Raw probiotic and enzyme blend, consisting of protease, phytase, and more. Who makes it: Raw One for Women is made by Garden of Life, a large-scale producer of supplements and health foods. For many years, Garden of Life has been a leader in the industry, manufacturing everything from multivitamins to healthy snack foods. 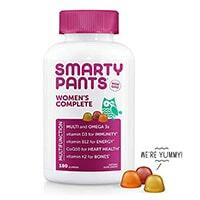 SmartyPants Women’s Complete is a dietary supplement that comes in the form of delicious gummy chews. With three tasty options to choose from, you’ll never get bored of these gummies. SmartyPants Women’s Complete not only contains all your essential daily vitamins but added Omega-3s for cell health and CoQ10 for heart health. Who makes it: This product is made by SmartyPants, a company specializing in vitamin gummies. SmartyPants is committed to delivering the best-quality to its customers – all products are free from GMOs and allergens. SmartyPants is also committed to environmental sustainability and international development. MegaFood Women’s One Daily is designed specifically to meet women’s health needs. On top of all your essential daily vitamins and minerals, this supplement provides 9mg of iron per tablet, to help overcome what is lost during menstruation. 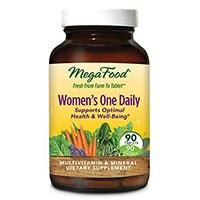 MegaFood Women’s One Daily is a superior-quality product made entirely from wholefoods. This is a complete multivitamin that is high-quality, a great value and contains the vitamins you need to look and feel your best. Who makes it: Women’s One Daily is made by MegaFood, a US brand that takes quality assurance to the next level. All its products are certified glyphosate residue free and every stage of their production process is carefully monitored to ensure only the finest quality. MegaFood is also a certified B Corporation, meaning that it meets rigorously standards for environmental performance, transparency and accountability. 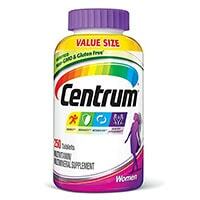 Centrum Women Multivitamin is a daily multivitamin designed to meet women’s holistic health needs. The formulation contains ingredients to boost energy and metabolism, support immune health and help to maintain a healthy appearance. These easy to swallow tablets are one of the best women’s multivitamins on the market today. Who makes it: This product is made by Centrum, a European nutritional supplement brand owned by Pfizer. Centrum has been developing health supplements made with carefully selected micronutrients for decades. All Centrum products comply with strict EU guidelines, so you can be sure that they are safe and effective. Opti-Women is a complete and effective multivitamin for women. Designed and manufactured by Optimum Nutrition, a leader in the supplement industry, Opti-Women is a one-stop-shop for your multivitamin needs. Providing a balanced blend of vitamins, minerals, antioxidants, herbal extracts and more, Opti-Women is a perfect way to supplement the daily diet of active women. Complete multivitamin and mineral formula, consisting of vitamin A, C, D, E, K, B6, B12, folic acid, calcium, zinc, and more. 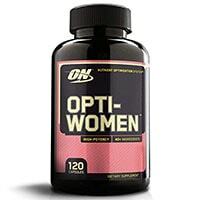 Who makes it: Opti-Women multivitamins are made by Optimum Nutrition. For many years, Optimum Nutrition has been an industry leader, developing effective and affordable products to suit the needs of the fitness community. ON is one of the largest and most-respected companies in the entire industry – and for good reason. They do not rely on marketing tactics or unproven claims to sell their products. Instead, they use scientifically proven ingredients in clinically studied doses to create effective and powerful supplements. 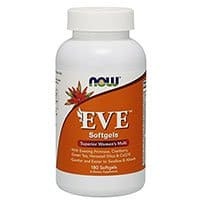 NOW Eve is a women’s multivitamin containing superfruits and more. It covers all the basic necessities, and also offers added ingredients like molybdenum, cranberry extract, antioxidants, silica, green tea and more. It does a good job at covering all the basic nutritional needs of the modern woman, and even adds some specialized ingredients and antioxidants. Complete multivitamin and mineral formula, consisting of vitamin A, C, D, E, K, B6, B12, folic acid, calcium, iron, and more. Added antioxidants, such as cranberry extract, green tea, and more. Who makes it: Eve women’s multivitamin is made by NOW Foods, a large manufacturer of health supplements and health foods. Since 1968, NOW Foods has been a leader in the health food industry, and today, they are one of the largest supplement manufacturers out there. 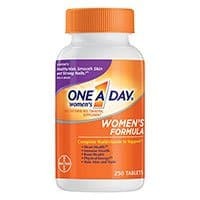 Bayer Healthcare One a Day Women’s Multivitamin is a simple, affordable and effective once-daily multivitamin. It uses a blend of the most important vitamins and minerals. It covers all the basic nutrients, giving you a balanced and effective dose of many essential vitamins and minerals. Complete multivitamin and mineral formula, consisting of vitamin A, C, D, E, K, all 8 B-vitamins, and minerals such as zinc, calcium, iron, and more. Who makes it: One-a-Day Women’s is made by Bayer Pharmaceuticals, one of the largest pharmaceutical companies in the world. Founded in Germany in 1863, Bayer has over 150 years of industry experience, and revenues in the tens of billions of dollars. Today, they make everything from aspirin to multivitamins to life-saving drugs used in hospitals. The Institute of Medicine and the National Academy of Sciences has published guides listing the Dietary Reference Intakes (RDI) amounts of every essential vitamin and mineral. You can use these figures to determine the amount of these nutrients you need on a daily basis, and how much you can take before experiencing side effects. Keep in mind that these RDI and RDA figures are for the average individual. Amounts may need to be adjusted based on your age, weight, diet, and several other factors. Speak to your doctor to determine more exact figures for your individual needs. Yes, you absolutely need more vitamins and minerals during pregnancy! In addition to all the typical nutrients your body needs on a daily basis (most of which you can get from your diet), you’ll need extra nutrients during pregnancy, including folic acid, iron, iodine, and calcium. In fact, some experts recommend that all women who may become pregnant take a prenatal vitamin. This is because a lot of folic acid is needed in the early stages of pregnancy, often before the woman knows that she has become pregnant. To protect against neural tube defects, at least 400mcg of folic acid per day is recommended for anyone who may become pregnant. If you’re actively trying to get pregnant, then taking a prenatal is fine for the short-term. However, prenatal vitamins can have negative effects in the long-term, so most doctors no longer recommend them for daily use unless a pregnancy is likely. The good news is that nowadays, most women’s multivitamins contain at least 400mcg of folic acid, which is the minimum amount recommended for a healthy pregnancy. That means that, if you’re taking a daily multivitamin, there is no need to take a prenatal vitamin until you become pregnant. On a daily basis, you will get a good portion of the necessary vitamins and minerals from the foods you consume. If you eat a healthy, balanced diet with plenty of lean meats, vegetables and fruits, you may get adequate nutrients from your diet alone. However, our modern diets leave a lot to be desired. Processed foods and cheap, convenient meals do not contain adequate nutrition to support a healthy lifestyle. In fact, every step in the processing of foods removes additional nutrients. This means that that frozen meal you’re about to eat contains just a small portion of the nutrients that those raw ingredients once had. If you eat a very healthy diet full of fruits and veggies and plenty of unprocessed foods, you’ll likely get enough vitamins and minerals from your diet. However, the vast majority of people do not eat balanced, healthy diets, and therefore do not get enough vitamins. To help supplement your dietary intake of nutrients, you can take a women’s multivitamin, usually once per day. Multivitamins are nutritional supplements that generally come in the form of pills, capsules or tablets. They combine essential and nonessential nutrients, vitamins, minerals, and herbal supplements to create a simple way to supplement nutritional needs. Women’s multivitamin will contain the vitamins and minerals recommended for everyone, with extra ingredients added specifically to support the female body, such as folic acid, iron, vitamin B12 and B6, amongst others. Multivitamins are intended to supplement a healthy diet, filling in the nutritional gaps. Multivitamins cannot replace or “fix” a poor diet, however. Establishing and following healthy eating habits should be your #1 priority. Unfortunately, there’s no “magic pill” to make you healthy – although multivitamins can help you maintain proper levels of vitamins and minerals. Nutritional Deficiencies: Multivitamins may help to prevent certain nutritional deficiencies. A nutritional deficiency happens when you don’t get enough of a particular nutrient from the diet alone – or when your body has difficulty absorbing those nutrients. Some deficiencies are quite common, while others happen rarely in the developed world. A recent study in the American Journal of Clinical Nutrition noted that multivitamins were helpful in reaching recommended daily intakes of certain important nutrients, like calcium and magnesium. Multivitamins are certainly not intended to serve as a replacement for a healthy diet – but they can help fill in some nutritional gaps in certain situations. Women’s Health: Multivitamins are designed to support many aspects of overall health, but some are more important for women than men. Multivitamins are very important for women’s health – and some estimates show that without them, around 75% of women would be deficient in at least one nutrient. There are many important nutrients that you can obtain through multivitamins, but some of the most important for women include: B vitamins, vitamin D, vitamin K, folate, iron, calcium, and magnesium. Pregnancy: Pregnancy significantly increases the need for certain nutrients. You’ve surely heard the “eating for two” saying, but there is some truth to it. During pregnancy, women should take extra care to get enough of the key pregnancy nutrients in their diets, including folate, calcium, vitamin D and iron. Many nutrients are important during pregnancy, but perhaps most important is folate. Folate, otherwise known as folic acid or vitamin B9. Insufficient folate intake during pregnancy can lead to an increased risk of birth defects, so getting adequate folic acid in your diet is key to a healthy pregnancy. Women’s multivitamins typically contain good amounts of folate and other key nutrients. However, if you do become pregnant, you will need to get a prenatal vitamin instead. Pregnant women should speak with their doctor as soon as possible to ensure proper nutrition during all stages of pregnancy. Overall Health: Multivitamins provide “a nutritional insurance policy”, according to Harvard School of Public Health researchers. By providing a wide range of nutrients that are important to overall health, these supplements provide a relatively inexpensive and easy way to ensure adequate nutritional intake. They are NO replacement for a healthy diet, however. There are also some more concrete examples of how multivitamins can strengthen overall health. Perhaps most impressive is this Journal of Nutrition study, which found that women who took a daily multivitamin showed a decreased risk of heart disease. Women of all ages – These products will provide a substantial dose of many vitamins and minerals that are essential to both daily life, and long-term health. While many of the good vitamins can be found in your daily meals, there are often nutritional gaps left in our modern diets. Taking a multivitamin is like getting an insurance policy that ensures you get enough nutrients in your diet. Getting adequate vitamins and minerals on a daily basis can have a wide range of benefits, both short and long-term. Female athletes and fitness enthusiasts – It’s no surprise that people who exercise on a regular basis need more nutrient-rich foods in their diets. The process of intense exercise is stressful to the body, and it burns a lot of calories. Therefore, if you exercise regularly, you need to make sure that you’re eating enough, and that you’re getting enough vitamins, minerals, and protein in your diet. For weightlifters especially, multivitamins are very important. The majority of multivitamins are taken on a daily basis. Often they are once-daily pills, but sometimes they are taken 2-3 times per day in small doses. ALWAYS follow the instructions on the product packaging. There is no benefit to taking more than the recommended dose. In fact, taking too many vitamins can cause harmful side effects. Do not take more than the recommended dose unless specifically instructed to by a medical professional. If the multivitamin you’re using is a once-daily, it’s best to take it in the morning. This will help provide energy for your day, and allow plenty of time for the nutrients to digest. If you’re wondering if you could benefit from multivitamins, we recommend talking to your doctor to discuss your options. For most people, taking multivitamins will not cause any side effects. That being said, consuming too much of particular vitamins can cause side effects. If you take more than the recommended dose of a multivitamin or take other vitamin supplements in addition to a multivitamin, you may be consuming too much of these nutrients. As long as you don’t take more than the recommended serving of a multivitamin each day, you shouldn’t experience any side effects. If you do, side effects are generally mild. The side effects you may experience from having excess vitamins in your system vary depending on the particular vitamin or mineral you have an excess of. Excess iron and calcium can cause toxicity symptoms, which can be significant. Other minerals and vitamins can cause mild to moderate side effects if taken in excess. As long as you do not exceed the recommended dose on your multivitamin’s packaging, you should not worry about getting too many vitamins in your diet. If you have questions or concerns, speak to your doctor. As with just about any product nowadays, there is a huge number of options when it comes to choosing a women’s multivitamin. While it’s difficult to choose a single best product, let’s take a look at some of the things you should look for when choosing a multivitamin. Included Ingredients – Step number one is to take a look at the ingredients and the nutritional content of the product. Ask yourself, does it cover all the basic vitamins and minerals like vitamin A, C, E, B1, B2, B6, B12, folic acid, zinc, calcium, etc? Does it include any additional nutrients, that may support your lifestyle? Take a close look at the nutrient content and the amounts of each nutrient, and compare it to the recommended daily intake. Application to Your Needs – How does the product you’re considering apply to your individual needs? If you’re a fitness enthusiast, you should look for a multivitamin that includes ingredients added to boost workout performance and/or recovery. If you’re just looking for a basic once-daily, look for an affordable and well-balanced product. Brand Recognition – Do you know the company that makes the product? Do they have a good reputation? Many companies will claim to be the best multivitamin brand, but there are only a select few that actually live up to their marketing promises. If you’re unfamiliar with a company or brand, read user reviews to get an idea of the community’s opinion of the company and product. Community Feedback – Another important factor is the feedback/opinions of the community. You can ask your friends and family what vitamins they use and what they think of them. Or, you can read online reviews to gather feedback. We all know that when it comes to being healthy, there are a lot of factors that are important to pay attention to. Physical exercise is, of course, a huge part of staying in shape and maintaining good health. However, the single most important factor in overall health is maintaining a healthy diet. Every day, our bodies need a certain amount of macronutrients like proteins, carbohydrates, and fats, and a certain amount of micronutrients like vitamins and minerals. To maintain good physical and mental health, a balanced diet is vitally important. Balancing your food intake and getting enough protein and healthy fats in your diet is essential to healthy living. Getting the proper amount of vitamins and minerals is even more important. Vitamins and minerals are essential nutrients. They help play hundreds of roles in the body, from maintaining the immune system to strengthening bones to healing wounds and so much more. Because men’s and women’s bodies are significantly different, women require different amounts of certain vitamins and minerals than men do. There are certain vitamins that are essential for women, but much less important for men. Vitamins and minerals play a large role in reproductive health and are especially needed during pregnancy. Now that you’ve learned more about multivitamins and what they can and cannot do, you have the tools needed to select the best product for you. While any product on this list would be a good choice, the best one really depends on your individual needs and budget.